Anybody who breaks the rules at a local homeless shelter would be reprimanded regardless of their religious denomination. That is the response of the Calgary Drop-In Centre in regards to allegations of unfair treatment levied at them from The Street Church Ministries. “It’s a reoccurring breaking of the rules, when they come in here and shout. We wouldn’t tolerate that from anyone. This isn’t about religion or faith, this is really just about noise,” spokesperson for the centre Louise Gallagher told Metro. Gallagher said the centre has asked several people to leave, including Morris Boyer, because of their behaviour when they show up at the shelter. “They come in and shout and holler and when they are asked to be quiet they generally don’t listen. We can’t have that here and would ask anyone doing that to leave,” she added. Minister Artur Pawlowski filed a human rights complaint against the centre on Friday, which also named executive director Dermot Baldwin. Pawlowski alleges that the Drop-In Centre has unjustly banned volunteers of the Street Church because of their association to the controversial ministry. Gallagher said she cannot comment on the complaint yet because they haven’t seen the file, but she did say the centre has not “harassed“ the members of Street Church. “We are a non-denomination organization and we believe in humanity rather than one religion above another. 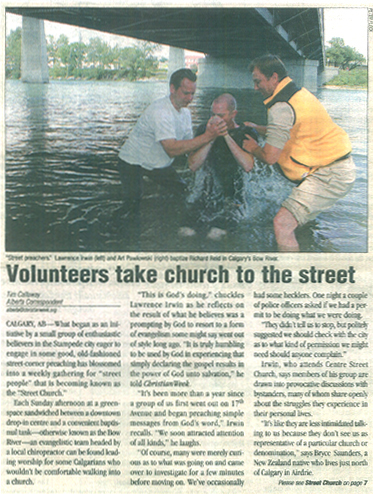 We’re not singling out the Street Church,” Gallagher said. There has been an ongoing feud between the Street Church Ministries and the Calgary Drop-In Centre, as well as the Mustard Seed, city bylaw services and the city of Calgary government. There is already a human rights complaint filed by Pawlowski against the City of Calgary including Mayor Dave Bronconnier and Bylaw services manager Bill Bruce. October 3, 2013 Artur Pawlowski Comments Off on Letter from America-Occupied?